A Close Look Under the Hood of NOSH 1.8.0. So I’ll start with two new features of NOSH 1.8.0 that benefits both the users (providers, patients) and the developer (me) that was recently released. I wanted to have providers attain the ability to create their form templates on-the-fly using a web-based interface similar to what WordPress uses for its blog creation platform, specifically regarding forms. 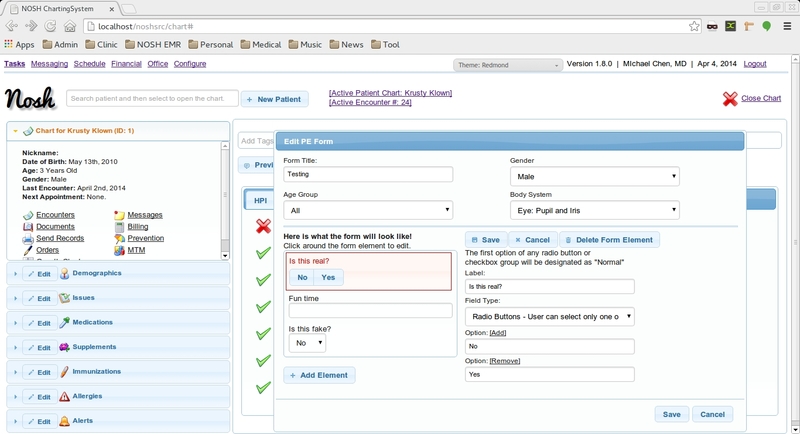 Thanks to the dForm plugin for jQuery, I was able to make this work as a proof-of-concept with the introduction of electronic patient forms. With JSON, form elements and their data was easily transmitted to the server and back. Applying this principle to the review of systems (ROS) and physical examination (PE) section of the encounters view, I was able to create an on-the-fly template designing tool. By designating the template to a particular element of the ROS/PE headings, one could create an unlimited number of templates for any condition. This is a screenshot where the provider can edit the templates (Configure link -> PE templates). 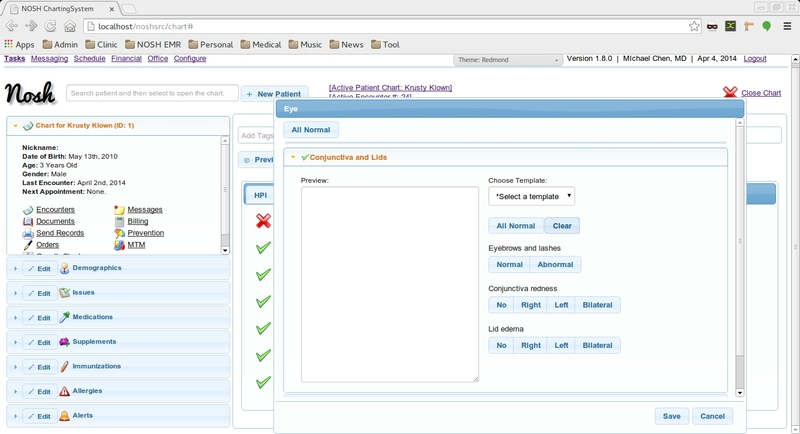 This is what the physical examination looks like with the template buttons on the right. Clicking on the button will transfer a value text into the preview text box on the left. Wow…this is such a far cry from what I was doing with plain old PHP and Codeigniter from a couple of years ago. Thank goodness for innovation and open source tools that keep getting better all the time! Tags: dform, GitHub, Laravel | Permalink.